It’s been more than a year since we published our first electric razor review, that of the Philips Norelco 1280x, which is still our favorite to this day. Since then we shared our opinions on multiple electric razors, with the desire to offer you unbiased research results, ultimately helping you make a better, easier and well informed decision when it comes to choosing your own shaving gear. 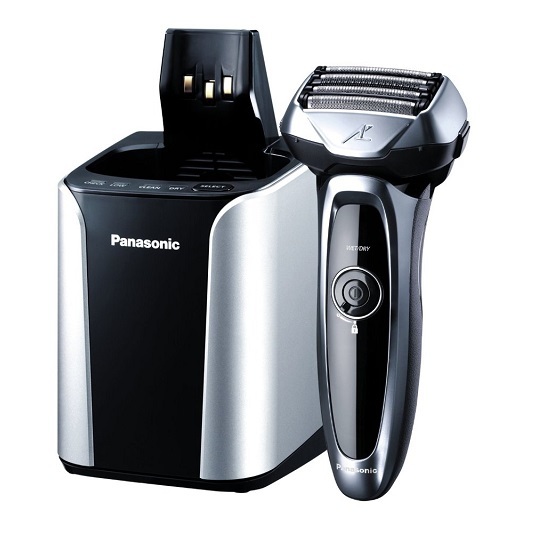 Today we take a look at the Panasonic ES-LV95-S, a foil electric shaver that promises to make its way among the top electric shavers on the market. The ES-LV95-S is slightly louder than other electric razors, because it runs at 14,000 cycles per minute. This is slightly higher than other models that commonly reach 10,000 cycles. Even though it is slightly louder it doesn’t wake up your loved ones next door. After a certain moment you will feel the blades warming up a bit, but nowhere near hot or disturbing. I actually thought this was a really cool thing because I feel like it’s really comfortable in the morning. I really don’t like brutal wake-ups, and this electric shaver definitely contributes to a wonderful morning. This is where the Panasonic ES-LV95-S really shines. It’s not too much to say that it’s one of the smoothest foil shavers that we researched until now. Compared to other electric shavers from Panasonic and Braun, the ES-LV95-S made a strong impression. We’ve put it to the test and asked 10 people what they thought after using this shaver compared to the electric shavers they were already using and the results are clear. Most people say the same thing. Visually it’s pretty hard to decide between the top electric shavers but when touching your face, the Panasonic makes it seem like you shaved using a safety razor. The results are astonishingly smooth, especially considering that it’s an electric razor. In our hectic environments, when most of us have to wake up every morning and be up and running by the time we have to start work, it’s daily rituals, that we can’t do without, like shaving, that can make a big difference. The time it takes to perform a quality shave with a razor can save you precious time when you need most of it. The Panasonic electric razor makes a strong impression in this field as well. It takes on average two minutes less to perform a quality shave with the ES-LV95-S. Cleaning the razor is really easy. You can rinse the head off under running water. After you finish shaving just put it into the cleaning station, and the rest gets taken care of by the cleaning station. Just remind not to start the cleaning cycle if someone’s sleeping near to it because it can get pretty loud. 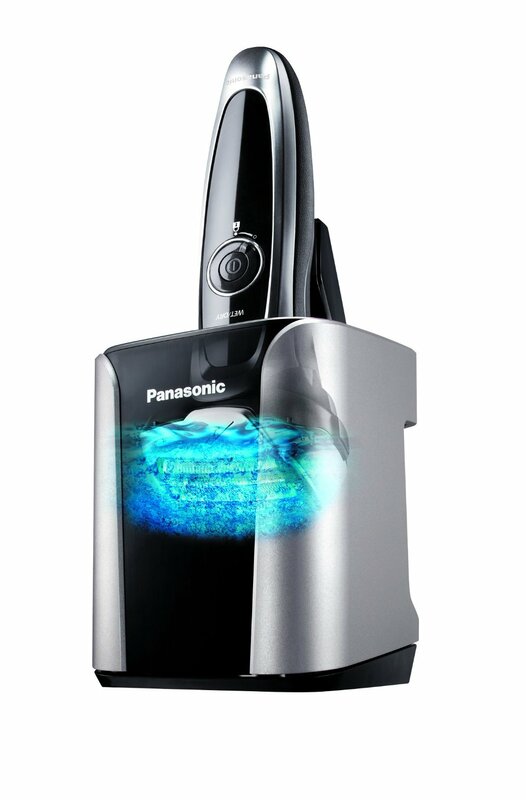 Just like the Panasonic ES-LV81-K and the ES-LA93-K, the Panasonic ES-LV95-S also comes with an included cleaning and charging station. You can also plug the power cord into the razor directly, or you can charge it using the station. The station doesn’t make an overall distinctive impression, it has clean lines and gets the job done. With the number of options available on the market, it’s recommended you go for a model that has a cleaning station included. It’s a smart addition to the electric razor, together forming a complete wet/dry shaving solution. With electric razors, you should always expect some irritation after the first few shaves. This is normal when changing you electric razor, because your skin needs some time to adjust to it. It’s not a particular weakness of this product but we thought that it should be mentioned, so you’re completely informed before deciding to purchase this razor. The Panasonic ES-LV95-S is an all around very good electric foil razor. The speed and quality of shave both wet and dry ranks it among the top products in its category. Join our growing email list! Get only the most relevant updates, including the best deals on top rated shaving and grooming products, delivered straight to your inbox. What to Do When You Cut Yourself While Shaving? Shaving Against The Grain – Do or Don’t? BestRazorForMen.net is a participant in the Amazon Services LLC Associates Program, an affiliate advertising program designed to provide a means for sites to earn advertising fees by advertising and linking to Amazon.com. Certain content that appears on this website comes from Amazon.com. This content is provided 'as is' and is subject to change or removal at any time without prior notice.